R.A.D. 1.0 the Robot . 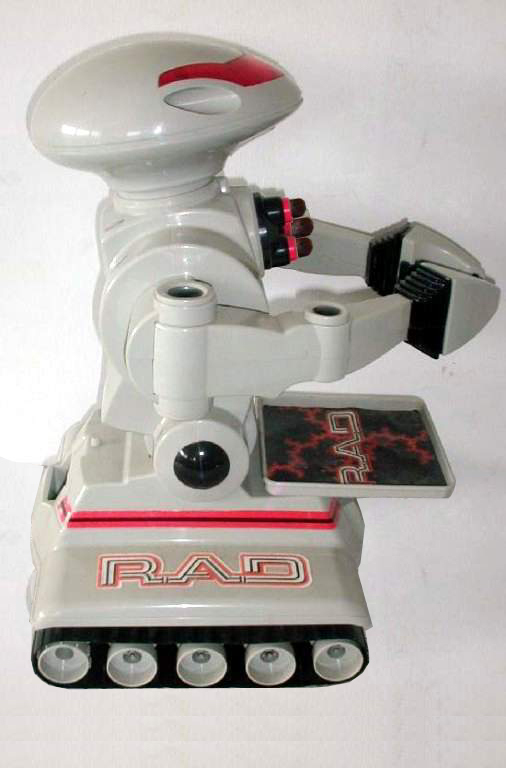 . . . . R.A.D 1.0 is made of hard plastic and the movable arms and hands have a clutch gear system so you can move things around with out breaking them and appear to be very durable. Left Tracks Forward, Left Tracks Backward, Right Tracks Forward, Right Tracks Backward, Torso Forward, Torso Backward, Arms Open, Arms Close, Microphone (There is a Mic on the controller, you talk into it, and R.A.D will talk out loud), Fire Missiles and the Shift is used for turning sound and lights on and off. Thanks to the independent left and right track control you can do a 360 in only slightly more space than RAD's footprint.